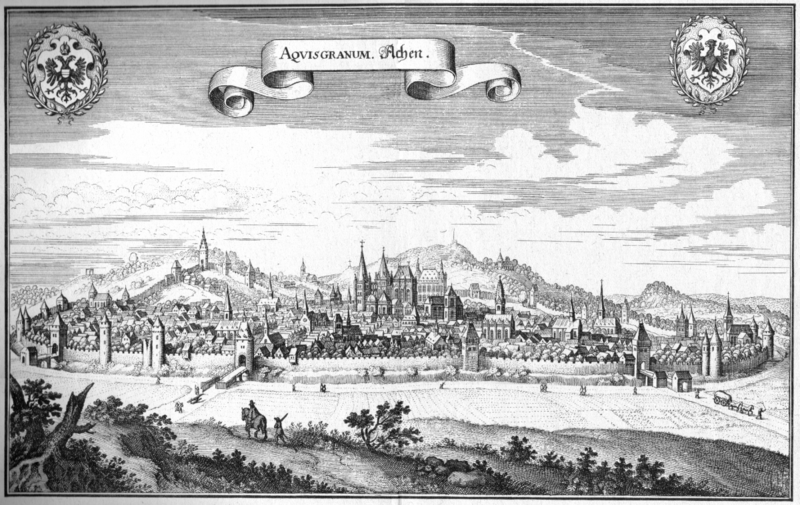 Though your characters are free to roam the world—and I’ve made a big effort to make the PC races be non-specific to Western cultures—we’ll be starting off the campaign somewhere in Europe, specifically at Bad Aachen, a hot springs resort town-turned-Early Modern “Babylon North” near the border between what’s now Germany and Belgium. Which is to say, if you folks feel eager to have your characters wander off to parts unknown? All the better… and I have some ideas about places where fruitful adventures might be had. (See A Little Weird World Geography for some hints about those locales.) Here’s some info about the general area. On top of that, Bad Aachen was a major producer of manuscripts in the Middle Ages, and caches worth a fortune—some of them invaluable to scholars, and others containing priceless occult secrets—turn up from time to time as well. Occasionally a priceless ancient idol is discovered, or an unknown subterranean passage. 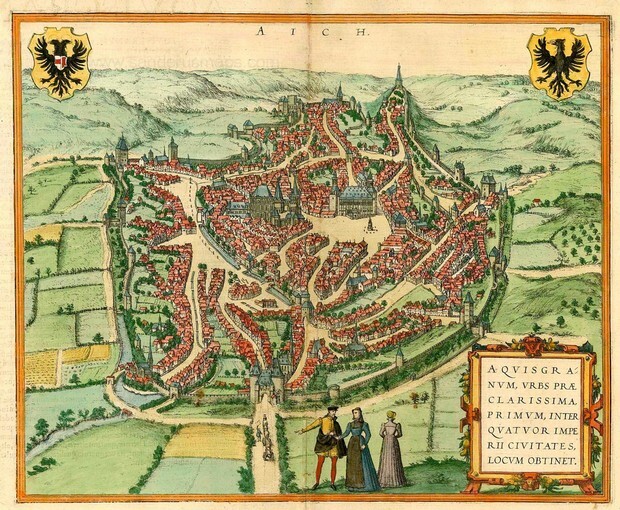 A couple of old maps of Bad Aachen. 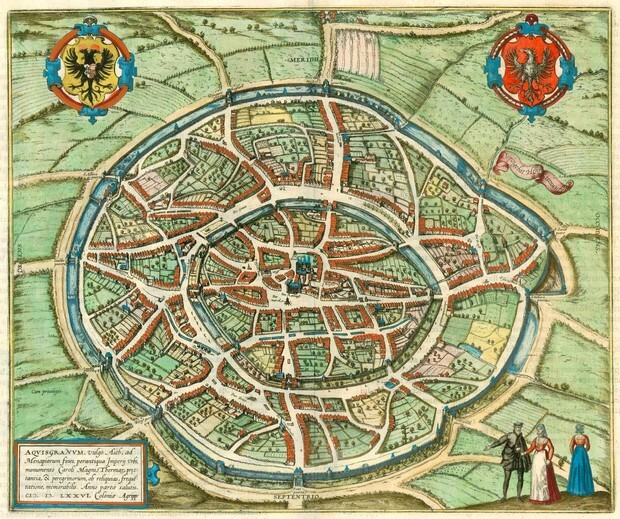 As you can see from the 17h century maps above, the area directly surrounding Bad Aachen is primarily composed of farmland. However, it doesn’t take too long before travelers find themselves—happily or unhappily—outside the reaches of civilization. Old, undiscovered ruins occasionally crop up, as does the odd wizard’s seclusium in some form of disrepair, or the occasional town that disappears off the map, or appears where no town has ever existed. The gossip mill in Bad Aachen is, of course, always grinding away, and a certain amount of grist is inevitable. But for the right person—and the right amount of coin—information is always up for sale… and that’s not even to get into the work-for-hire opportunities available in the town. As most adventurers aren’t even really very well-acquainted with the actual operation of the town—how it is governed, by whom, how well or poorly—that is left up to the party to investigate and learn about, or to ignore.